Recently I had the opportunity of acquiring an old camera. By old I don’t mean "it still uses film" old, I mean "really" old on the antique level. I’m not an expert in the industry of antiques acquisition but since I had this opportunity I started doing a little research. In any case, my approach in this article is not for those who want to buy an old camera to sell it later for profit (although many things I’ll mention would still apply). The market is huge and has many different variables that can affect the outcome of a good deal. Nonetheless, there are a few basic things you need to consider before pulling out your credit card to pay for a beauty like this. 1 – Why do you want to buy an old camera? Resist the buying impulse. I know old cameras are beautiful and very tempting, but defining why you want one is probably one of the most important things you need to think about. Do you want it just for the looks of it, to exhibit it on a shelf on your living room not to be used, or do you intend to load it and actually take it to the field and use it? Your answer will determine the working condition you need the camera to be in and thus the amount you may expect to pay for one. 2 – Where to buy an old camera? This one is endless. Everywhere, from yard sales to ebay. Just look around a bit and I’m sure you can find many for sale. The question is, what do you want to buy. If you have a specific camera in mind you can try on a specialized dealer. You’ll get to talk with someone who is probably doing this for years and knows what he’s talking about. Usually these people can describe exactly the condition the camera is in and, if they have it on the store, you can handle it and examine for yourself all the little details. The downside is that you’ll probably end up paying a little more. Online auctions can provide good deals but are a bit more risky since you won’t have the chance to have the equipment in your hands before you buy. That’s what Google is there for. And I’m not talking just about the prices (more on that bellow). Nowadays, you know what to expect from a camera and everything is described in much detail on the manufacturer’s catalogs. On the "old" days, not everything was so clear and some batches of cameras could come into the market with mechanistic issues that never got solved. Specially if you are planning to use the camera, you need to know if there were problems that you don’t want to deal with now (as an example, the Kodak Signet 35 had a very problematic shutter). Also, while today any change in the model is reflected in the model name, it wasn’t always so. The same model name did not always describe the same equipment (as weird as it may sound). My best advice is to always know the serial number of the camera you want to acquire and do your research on it. If you look around, there are sites maintained mainly by collectors (and usually dedicated to a specific brand) that list serial number ranges and any particular modification done to a specific batch. The camera condition is of uttermost importance, specially if you intend to use it. While you probably won’t mind the normal signs of age and use, a crack in the bellows or fungi in the lenses will render the camera unusable until it is repaired (if indeed it can be repaired). This is specially dangerous if you’re buying it online. If a camera is listed as sold "as is" you probably won’t have the chance to return it even if you find out that the seller forgot to mention the rusty lens mount. Try to ask as many questions as you can and know all the details on the condition of the camera. If possible, and many times it is not, if the seller is the person who used the camera before, try to find out how many photos were taken (the life of a shutter screen is not unlimited). Any sign that the camera was ever dropped is also a big no-no. The first thing that many sellers think (usually people dealing with antiques, but not specifically cameras) is that the oldest a camera is, the more valuable it is. Don’t fall for this one. It’s not so. There are cameras that are valued at a few thousand dollars, and other cameras from the same period that are worth next to nothing. This has to do with how rare a camera is (how many were manufactured vs how many lasted until now), how good it is, and also how famous it became on the hands of a particular photographer. The price that a seller asks can be an educated value or just simply someone throwing a price out and waiting for it to stick. You can have a taste of this on ebay. Search for a particular camera model and you’ll probably see a very wide range of prices asked. This, of course, depends on the condition of the camera, but can also reflect sellers not knowing the value of their items. Again, Google is your friend and, for many cameras, you can find good estimates of the values. If you want a more educated guess, there are a few price lists in print that can help you. With this article I do not intend to give you all the information you need, but buying an old camera can be a risky business, specially if you want to use the camera, and these are just a few tips to get you started. Have you ever thought about acquiring an old camera? If so, why? Any bad or good stories to share? What timing! 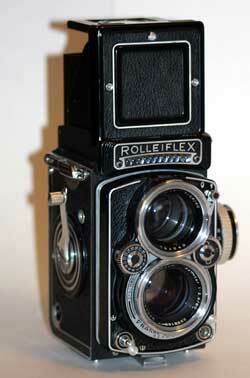 I actually just bought an old TLR a few days ago — it shipped out today. How timely! I am a fan of older cameras and most recently (this morning, actually) picked up a Canon Demi at a garage sale for $3. Works perfectly! Ran a roll of film through it and there are no problems at all. Also recently bought an Olympus Trip 35 on ebay hoping for the best and it too was perfect! I love having the older cameras AND being able to use them. It’s fun, great results and great conversation starters as well. I hope you enjoy it. TLRs are fantastic pieces. For $3 and in good condition? Why is it that I never get any deals like that? How much did you pay for the Trip 35, if you don’t mind me asking? And thanks for passing by. Then again, if they don’t work, you could always use them for TtV! That is a very nice point and something that I never gave much thought, although I’ve seen some amazing work done that way. There are some Photoshop actions used to replicate TtV photography, but nothing like the real dea, right? Searching on flickr for the models your interested in is another good way of finding out information. Often I email users and ask about their experiences and whether there are any pitfalls I should be aware of. My best one yet? A non working Pentax 6×7 (non MLU) as a Christmas present from my local lab. $120AUS later and it was working. While I’ve had to spend another $150AUS on it, it still beats the prices they sell for on ebay. That’s a very good point: Looking at work done with the cameras before you buy might give some hints as to if it will fit with your style. OK I see that there is a website for this but not sure how to how to use it, LOL. I have come across an old camera a (Kodak Duaffex2 camera). How do I go about finding the value of this? I was told by a few friends that it is worth about $500. I’m not sure if it works the film it takes is larger then 35mm. I have an old Nikon FM2(1982) camara, how much is it valued for? And also how much time does it take to be considered an antique. Unfortunately the film SLR market has dropped immensely in price. Nikon actually did better than most, but still got beaten hard. I have never used the FM2, but from what I’ve heard (a friend has one) and browsed around, even the 1982 ones (black, right?) in very good condition go probably for $120-$200. I’m assuming you’re talking about the camera body without lens. Please use these number as a very uninformed guesstimate. A used-cameras store could probably give you a much more accurate number. editor, photographer, etc. He did everything but he loved photography.